Congratulations to our U12A girls who won the U12 League Championship title last Sunday after a 5-0 home win over Kinvara United. Ella Farrelly and Alannah Farrell both got two each while Sara Craven rounded off the scoring. Tom Hussey’s team will play their final league game at home to Kilshanvey United next Tuesday at 6.30pm and will be presented with their league medals after the game. Well done girls and coaches on a great season. Earlier on Sunday, the U12B girls (pictured) moved a step closer to the Division One league title after a fine 3-1 home win over closest rivals Maree/Oranmore. Liam Walsh’s team are level on points with Maree/Oranmore but have played two fewer games, so all still to play for in the final weeks of the season. The U13 boys moved into the Premier/Championship Cup semi-final with a 3-0 home win over Oughterard, while the U15 boys were defeated 7-1 at home to Knocknacarra with Tom Doran on target for United. This Saturday coming sees our U12 boys travel to play Kilglass of Enniscrone in their Connacht Shield semi final encounter and we wish them the best of luck while our senior team play their final league match at home to Corofin. A win for Craughwell will keep second place and promotion in their grasp with other teams yet to complete their fixtures in the coming weeks. 7.30pm - 8.00pm - U9 Boys and U10 Girls. 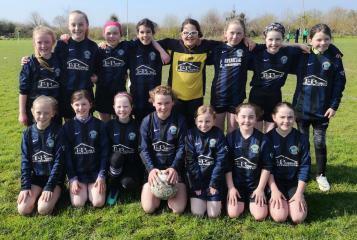 The Craughwell United U12B girls team who defeated Maree/Oranmore at Coleman Park last Sunday. Back row: Lauren Morgan, Amy Coyne, Jessica McGlynn, Naia Guido, Rebecca Walsh, Kelly Hallinan, Sophie Keenan, Alanna Clancy, Front row: Chloe Keane, Sophie O' Callaghan, Eabha Molloy, Katie Murray (c), Aoidin Kavanagh, Lily Walsh, Katelyn Walsh.